← Grayling – how has your season been? Well opening day for 2013 is almost upon us. 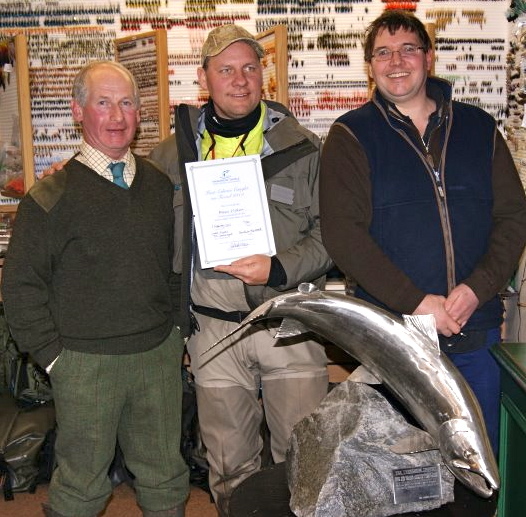 So who is going to be the winner of the prestigious Tweedside Tackle trophy this year? Have a look at the excellent video made of last years winner Magnus Klintheim from Sweden who fished Lower Floors and is pictured here with Tim Pilcher of Tweedside Tackle and Jim Smail head boatman on Lower Floors. The team are coming back for 2013 opening, so are obviously hoping for a repeat performance. Tight Lines guys. We need the river to drop a good bit from todays levels, but whilst the forecast is for up to 10mm of rain today (Tuesday), the rest of the week is for showers and partial cloud. Here’s hoping ‘they’ have got it right! The river has been running high a lot during the close season, so please don’t expect to go into your usual stretch of water and it be the same as it was. It won’t be! With all the extra water and recent snow melt, hopefully the river will have some nice new spring fish, but there will be also inevitably be some kelts around and it is important that anglers return all these fish carefully to the river. There is an excellent leaflet available on the RTC site. Please remember it is fly only until 15th Feb and total catch and release as per the Tweed Spring Salmon Conservation code until June 30th. Please treat all fish with the utmost care as per the leaflet mentioned above and whilst we would like pictures, please we will ignore any of fish held at arms length out of the water with no sense of perspective. The RTC also have an excellent weight/length chart on their site which can be viewed here. Friday’s forecast is for a cloudy morning and some showers in the afternoon with a gentle to light north easterly wind, freshening on Friday night. Temperatures to range between 3 to 6 deg, with around 4 to 5 throughout the day. Saturday is to be cooler with the moderate wind turning to come from the North! Also the forecast is for cool temperatures so don’t forget your thermals. Anglers will be making careful use of intermediate lines with heavy sink tips and tube flies in these cooler waters. Patterns being of the usual early season ones which are recommended with black and yellow being the choice of many anglers on the river. The black and yellows come in many different patterns ranging from the ‘Tosh”, to “Gordon’s Fancy”, “The Melrosian” and “The Eternal Optimist”. The ‘Posh Tosh”, “Gold Bodied Willie Gunn”, “Tailfire” and “Cascade” and of course the “Junction Shrimp” are also alternatives giving you plenty of choice. All anglers are requested to complete and sign the G.S Declaration document before they begin to fish. This is crucial if they have fished outside of the U.K. There is good availability for all types of fishing on the system, so go to our Find Fishing and do a search for whichever species you are after. Warming clothing and a hat are a must in often freezing conditions. A lifejacket should also be worn whenever you are fishing, wearing one at the river is a good habit to get into whatever you are doing. Do let us have any photos of your catches for our blog and facebook pages as well as the “your Photo’s” page on FishTweed. May we at FishTweed wish everyone Tight lines for the opening days of the 2013 salmon season. This entry was posted in Uncategorized and tagged salmon conservation, spring fish, spring salmon. Bookmark the permalink.